Between 1954 and 2014, JMA recorded an average annual snowfall in the Niigata region of 169cm. 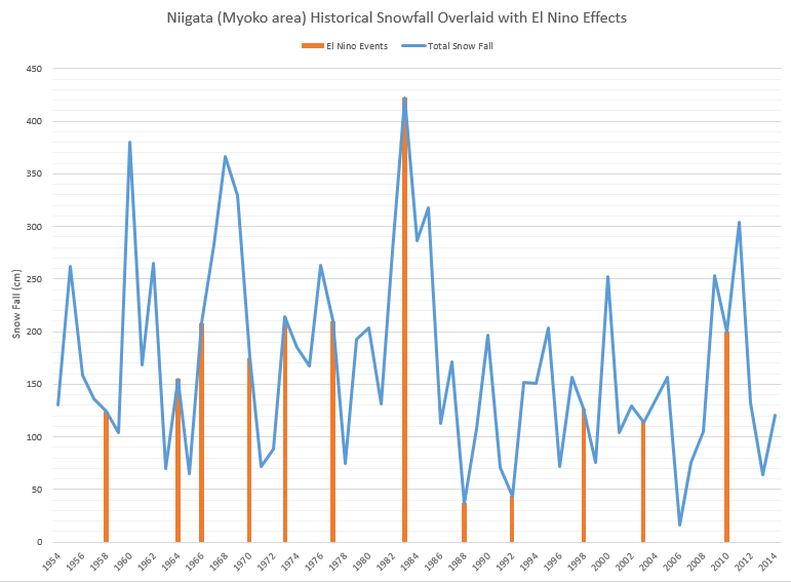 During the 12 El Niño cycles listed below, 6 years had snow fall below the average and 6 years had snow fall above the average, indicating that an El Niño cycle in the Niigata region is historically a wash. It's a 50/50 bet according to history! But when you win in Niigata, you really win big according to that huge spike in 1983! Unlike in Nagano, on the west side of Japan, you can really see that the effects of El Niño are stark. El Niño cycles such as 1964, 1974, and 1983 saw huge spikes in snowfall during the cycle while 1958, 1988, and 1992 saw huge drops in the mount of snow fall.